In brief, Project Hydro is a decentralized project curated by the Hydrogen Platform Corporation who is based in New York City and are a recognized leader in the design of financial technology platforms with successes such as the Financial Web 3.0 — an open-sourced, global ecosystem for financial services. Hydrogen consists of Atom (core tools to build financial applications), Ion (machine learning and AI capabilities), and Hydro (blockchain and decentralized layer). It is common to have a misconception between the terms Hydrogen and Project Hydro. 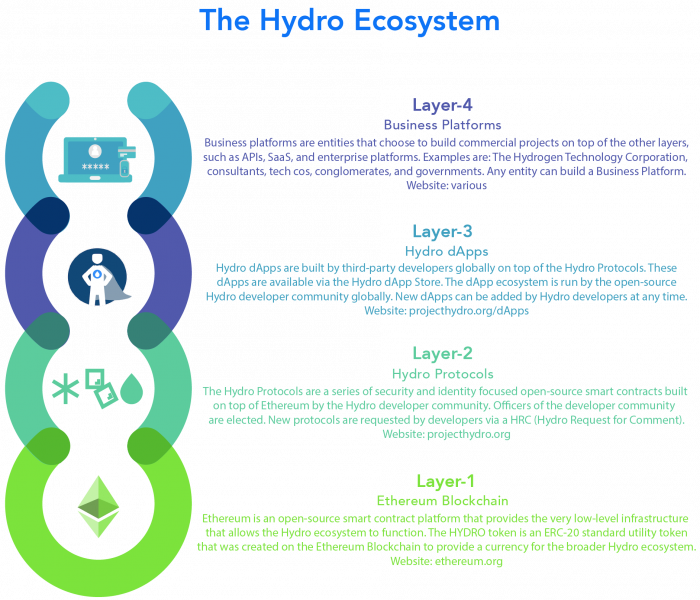 Hydrogen is the parent company built on top of Hydro protocols, while Hydro protocols are a series of smart contracts built on top of Ethereum with Hydro tokens being used for different API (Application Programming Interfaces) calls & access. Hydrogen is also the company that created the $Hydro token and Atom. In short, the Hydro ecosystem consists of 4 different layers with Hydrogen being on the 4th layer. Hydro aims to decentralize financial services by bringing the public blockchain to traditionally private systems. It allows developers around the world to enhance their platforms and applications by leveraging on blockchain technology. Hydro is envisioned by Mike and Matt (Co-founders and CEO) as the global standard Web 3.0 platform for fintech, where developers from all over the globe can build fintech solutions to solve problems of the billions that are unbanked. There are various protocols and APIs that are developed by the team and the community. These APIs and protocols are 100% free and accessible, and they include Raindrop, Snowflake, Ice, Tide, Mist, and Hail. Hydro is the native token of the Hydrogen platform and is it is already listed in some exchange markets (Bittrex, Upbit, Bitforex, Coinex, etc). Hydrogen’s ecosystem consists of many different parts covering security, dApps, identity, documentation, payment system, tokenization, and AI. A highly detailed explanation of the ecosystem and protocol can be found here. Hydrogen has huge clients and partners of which include T.D. Bank, Principal, CI Investments, as well as many other smaller partners. These partnerships brought together over 40 million customers globally. T.D. Bank is one of the largest banks in North America and the largest in Canada, with $1.3 Trillion CDN in assets as of July 31, 2018, serving more than 25 million customers. Detailed article here. The team has also revealed that they have just established relations with two of the biggest tech companies in the world. 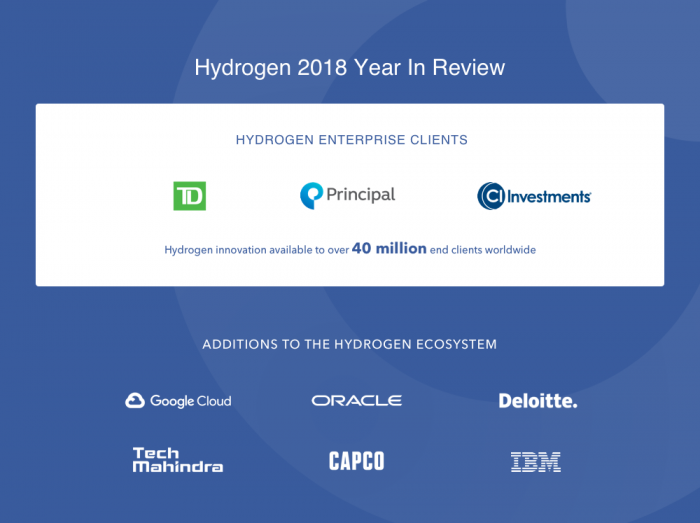 An article by the co-founder and CEO of Hydro sums up the year 2018, which shows Oracle and IBM as new additions to the Hydrogen ecosystem. The collaboration with IBM is focused on reselling and marketing of Hydrogen's products; this means that Hydro's APIs are exposed to more professional developers all over the globe. This creates more potential integrations in the long term, whether it's a decentralized application (dApp), API, or as a layer 4 company. Full article of collaboration with IBM is found here. Hydrogen has also added Google Cloud, eight fintech hubs globally, four global consulting firms, some of the most prestigious blockchain projects, and top European fintech incubator LHoFT. Some community members have been diligent in research and found that Oracle has added Hydrogen as a silver partner. However, no official announcements have been released by either party. The severity of the bear market in 2018 caused many blockchain related companies to cease operations. However, Hydrogen is a profitable startup in the year 2018 which is a big achievement, considering Hydrogen has raised no equity financing. Only 17% of tech companies that went public in 2017 were profitable, let alone tech companies in their first year in operation. The team will be releasing Hydrogen's financial report sometime in Q1 2019. Hydro also became a part of the ERC-725 alliance. ERC-725 is an Ethereum-based identity standard authored by Fabian Vogelsteller, creator of the ERC-20 standard and Web3.js framework. 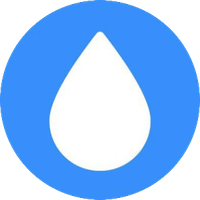 Hydrogen also released their first product, Raindrop, on the Android and iOS store. 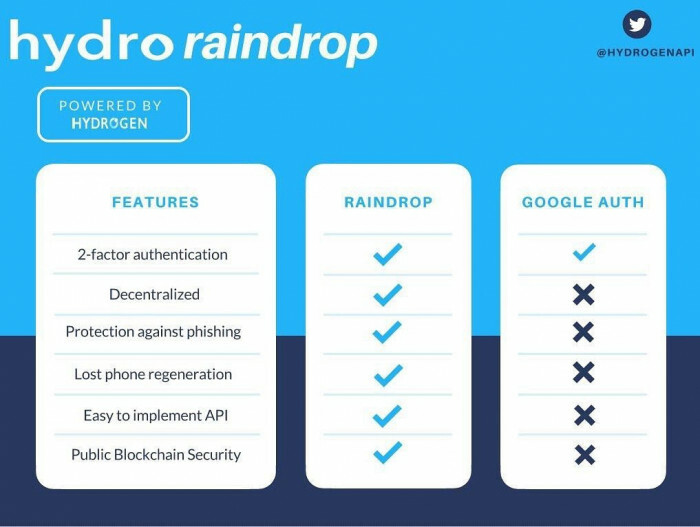 Raindrop is a blockchain based MFA which is completely decentralized and is more superior than the Google 2FA. Tokens are required to call functions on Hydro's Smart Contract and build products in the Hydro ecosystem. Snowflake and Hydro dAppstore are scheduled to be launched in Q1 2019 and this will be the game changer for Hydro. To get a better picture of what dApps and the dAppstore is, this article will be useful as it showcases a real use case of dApps. 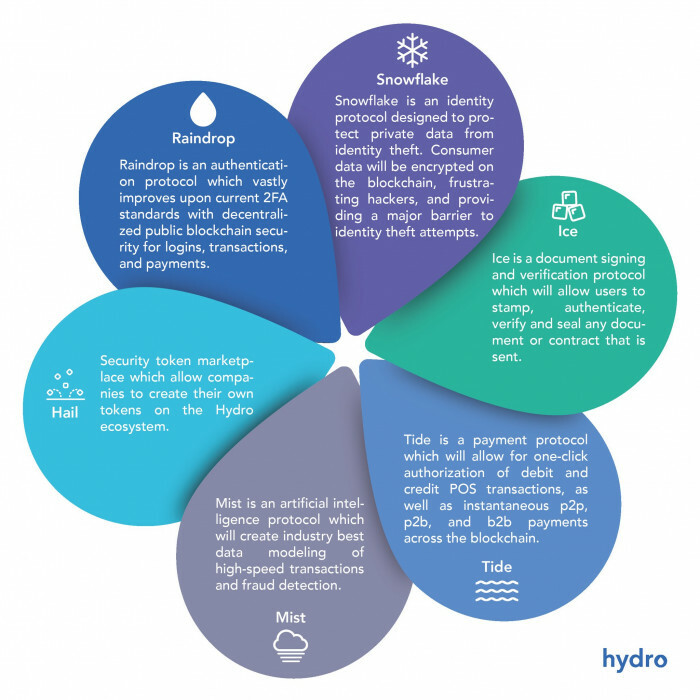 Snowflake or ERC-1484 is one of the protocols of Hydro that solves the identity problem and is built for (Know Your Customer)KYC/(Anti-Money Laundering)AML purposes. This will act as the standard identity resolver on Web 3.0. Coupled with your Snowflake identity, you are able to use many different kinds of dApps from the dAppstore. The dAppstore will allow developers to deploy financial dApps that solve business needs across investing, savings, insurance, lending, credit, capital markets, and much more. A more in-depth look on Snowflake + Hydro dAppstore can be found here. Most Hydro protocols require the movement of Hydro tokens between users in the ecosystem, others require staking of tokens by interested third-parties. For example, dApp creators who list their dApps are required to "stake" a minimum amount of tokens for the dApp to continue functioning. Staking is required for service providers onboarding new users into the platform. This increases the number of reliable service providers for the many users of these sophisticated applications. This also prevents developers from abusing the system or creating loopholes for personal gain. Secondly, it is more efficient to include a currency within the ecosystem. 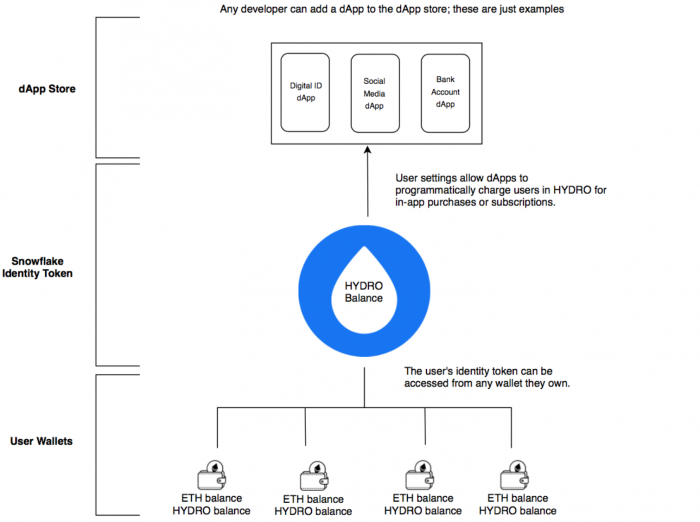 Hydro is designed to handle huge complexities of building a dApp for a developer. A part of this toolbox is to enable developers to easily create sophisticated payment gateways between them and users. This opens gateways to support user-service interactions using the Hydro token. With this staking mechanism, demand will surely increase with more adoption. Creating awareness will hook in more developers looking to build something with tools not found elsewhere. Much of this sounds like the story of Bitcoin. Satoshi created a digital asset as a store of value and payment system, and a few years of development disappears and hands over the power to the people. Hydrogen appointed a number of qualified individuals all over the globe to develop, sustain, manage and creating awareness for Hydro. They are known as the Decentralized Ambassadors(DA) and they manage many Hydro-related activities such as Hydro development, Product integrations and testings, Exchange listings, and so on. 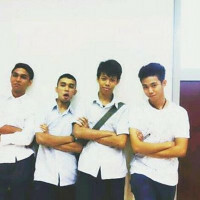 They also assist the main core team in many ways. All DAs, in good standing, will be distributed 222,222 HYDRO per month over 24 months, with the tokens released from escrow via a smart contract as a way of remuneration. The following is a selection of duties that can be expected of the DAs. The community can suggest new and creative tasks and activities for the DAs at any time. If you are interested to apply for the role, please refer to this article. In the initial stages of the project, Hydrogen did not receive any funding from ICO. Instead, the team organized an airdrop for verified developers and each verified users received a standard amount of Hydro tokens. They reviewed users’ GitHub profiles for repo activity and made thorough checks to prevent duplicate entries. Once approved, each developer receives 222,222 HYDRO. In the end, approximately 11,200 participants received the airdrop; 2,632,330,741.57 HYDRO was distributed in total. At the point of distribution, Hydro tokens did not hold any value until it was listed in the secondary market. To this day, almost all ICO projects are down close to 90% in price from their point of offering. To understand more on the token distribution, this article will be useful. Hydrogen receives revenue from clients who use the Hydrogen platform, including large financial enterprises. The hydrogen team also put up the Hydro Community Development Program (HCDP) which aims to be a decentralized program where anyone can create tasks regarding the expansion of the Hydro technology ecosystem. It is not a case of any DA simply writing and posting tasks as they like on the Github HCDP tasks. There is a system of reporting, reviewing, and voting for each task. Once the appropriate stages have been completed, a DA puts up the HCDP task for developers. This ensures fairness & consistency across the program. If you are a programming wizard, you can check out different kinds of bounties here. Some tasks give out as high as 3 million Hydro tokens as a reward. Hydro's GitHub has details about the DA Recruitment & Selection Process, and the Governance Structure. Hydrogen team will release a financial report in the year 2018. There is a community brainstorming area that welcomes non-fintech or fintech based ideas. There are different competitors for different phases, Civic for Snowflake, Storj for Ice, Ripple for Tide, and Numerai for Mist. One look we observe that Hydro is everything under one roof, creating an ecosystem that clearly captures every essence of the Blockchain technology. Hydro is not a problem-specific tool because it is versatile, robust and sophisticated in its use of blockchain; also, it is an ecosystem that tackles various problems of different complexities that exist in fintech space as of today. Because of these unique features and tools, many institutions have set their eyes on Hydrogen's products and added it to their cloud services for others to work on. It is only a matter of time before services switch to WEB 3.0 and use hydrogen's technology to create a better Operating System for financial services. The first step in solving a problem is realizing there is one. The world is not fully connected; it is inefficient and unautomated. Blockchain will solve this problem and I believe Hydrogen is ahead of its time & will be the leading pioneer of WEB 3.0. With a strong team, community (shoutout to the #HydroArmy), top tier financial institutions as clients, advanced working products and decentralized project and ecosystem; Hydro should be on your radar. Today's gain is another one's lost in the future, so to longterm holders, i hope this article remind you why you should #Hodl $Hydro. 4. Twitter: @MrCryptoKrabs_, Is Hydrogen #Hydro on your radar? Because it should be!